Fabry's disease and my family. I have no beads or jewellery to show you, I am afraid! I can, however, tell and show you something that I have been working on these last couple of months. Actually, the last 6 months or so have seen me very busy, settling in to my new home and all that that entails, re-establishing my work and building up my client hours again and generally learning about and living in a new location. We have been working on the house putting our "own stamp on it".... renewing and repairing. The first room to have some major work done to it was the small ensuite bathroom. While the room was essentially functional, it was quite outdated in appearance and I think, did not have either a very satisfactory layout or storage. In the old bathroom configuration, the toilet was the first thing you noticed when the door was opened (not nice!) and the vanity had very small drawers and a skinny top with not a lot of storage either inside or out. Old vanity... toiletries still waiting to be unpacked here! New vanity... still only a single sink, but lots more storage. It is also the first thing you notice when coming through the door, (much nicer than the previous toilet!) The doors and drawers all "soft-close" as does the toilet, a wonderful little luxury. I love the spacious "farm-house" style sink and lever taps. 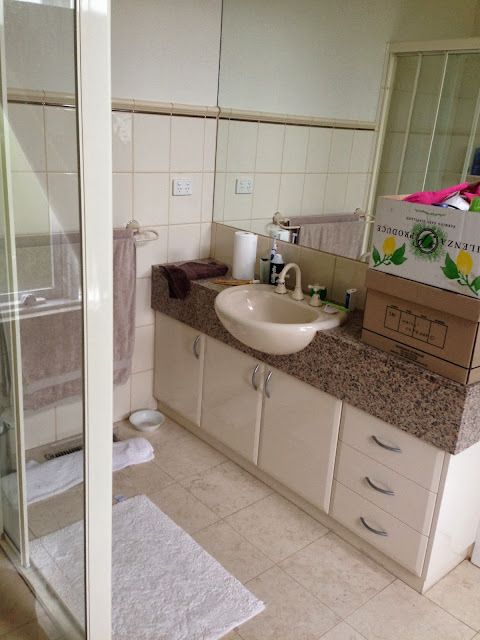 Sorry about the reflections... the floor is all one level.. and has been carefully sloped so water drains away.. it works so well.. does not come out from under the frameless shower door at all. The floor tiles are a medium 'mink' type of colour, the shower tiles are a gorgeous damask design and the rest are a coolish beige. All very neutral, but they look quite good together even if I do say so myself! The damask feature tile is gorgeous! It is textured and both reflective and satin and has about 4 different muted colours throughout. This covers two sides of the shower recess. The shower niche has a base to match the vanity marble top..This wall is in the plainer coloured tile. The window will soon have white plantation shutters to match the ones you see reflected in the mirror which are in the walk in wardrobe. Crystal, look- a- like lights are on each side of the mirror. These are more modern in style as I did not want the bathroom to be TOO traditional in appearance. The toilet is now located where the old vanity once sat... a much better location. So that's it! I hope you think it looks better! My brother-in-law, Robert, (from Bayline Homes) and team did a great job. Next year we will attack the main bathroom... and that will be another post! Continuing on from my previous post about the wonder of finding gorgeous sea-glass on my local beach, I decided I had better do something practical with it! I decided to drill some holes through which I will thread a jump ring. To achieve that, I used a 1.5mm Diamond core drill bit (from Rio Grande) with my battery operated dremel to make a hole in the glass. I rested the glass on a piece of wood which was immersed in water (just covering) so the glass and drill bit were both slightly covered when drilling. This keeps the drill bit from overheating. The core drill bit was 180 grit... next time I purchase, I may look at a rougher grit, as it did take a while to drill through the glass... but maybe I was just being too impatient! The one with the red mark is waiting to be drilled. I used a permanent marker so I could see the exact place to rest the drill bit underwater. Next stop... jump rings and jewellery! You probably think I have died or given up on the blog... or something along those lines! Well, obviously the first is not true and the second... well... let's just say I have had a long hiatus! Part of the reason for my absence was selling and moving house. Yes, a big adjustment for anyone after 25 years in one home. I have moved from a suburb close to the city to one a little further away, but also within walking distance to a beach. This is very new for me and I must say I am really loving that aspect of my new location. Recently, I have discovered a little bay that seems to offer up little "treasures" on every visit. I have always been on the lookout for beach glass ... long before moving here. I have never had much luck finding beach glass, and the few pieces I did collect over the years, have been carefully kept with the thought that I would add to the collection.. one day! Well, let's just say that collection is now growing (almost) daily and at a rapid rate! I will soon have enough that I can actually make something with it ...possibly a mobile, possibly jewellery? Here are a few photos of items collected during today's beach stroll. Today's beach glass.. I am thrilled with the colours! Pottery shard...I also love to collect heart-shaped rocks... but this was a real find today! Interesting texture on this shell and some glass pieces, previously clear and now aged by the sea. A lovely old plank. And an almost, heart - shaped piece of glass! As well as doing an (almost) daily walk to the beach, we are working on our new home. There are, of course, many things to be done, adjusted and changed... so I will be posting soon about that too. Meanwhile, I do have to say, it feels good to be back! Sorry I have been missing in action for so long! Ghastly hot weather has left me flaked on the couch and devoid of energy. I have recently sold my old Victorian house. I have lived there for 25 years. I am on the hunt for a new home and have been looking at houses, both modern and more old fashioned in style. 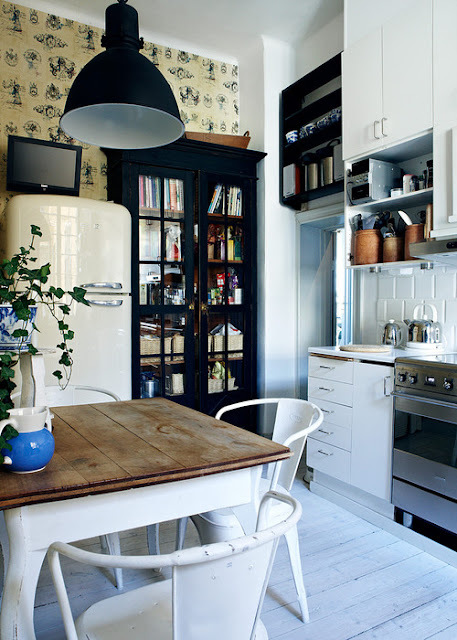 Sometimes I think I love modern and convince myself of it.. and then I see a house with character and nooks and crannies and delightful kitchens like the one above, that is full of interest and charm ( well it is French!) and I fall in love with old once again. I wish I could make up my mind! 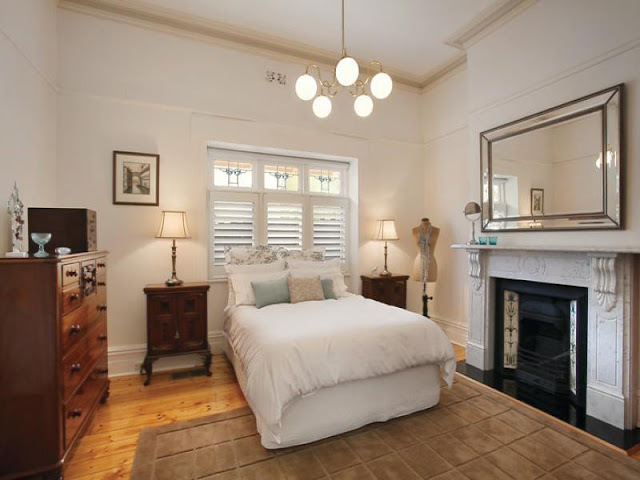 An older style home is just winning the choice by a nose at the moment.. 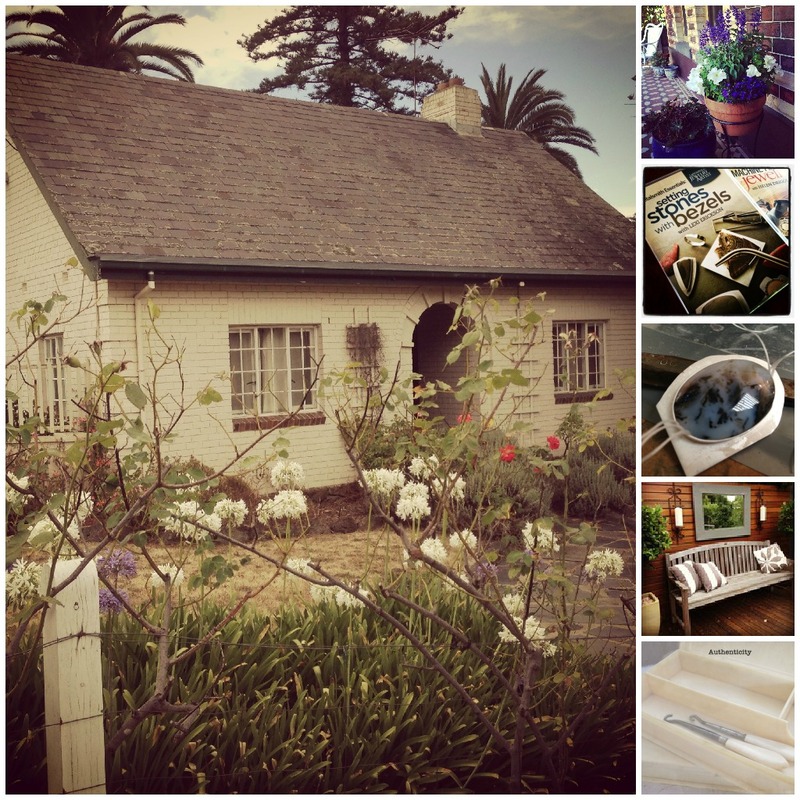 I have a yearning to find old bits and pieces to put in a home and to plant a garden again… can’t help it… that is just who I am I think… and maybe I just shouldn’t fight that!? I did say I would not ‘do’ an old house again…. they are expensive to maintain etc etc. But yet….?! Charm just might win in the end! I will keep on with my journey until I find something that I think is probably a compromise of both old and new… for the right price of course! It is not an easy task… wish me luck.. I need as much as I can get! So tell me, have you ever felt this difficulty, this battle between old and new? This decision between what might be easier and what you are drawn to regardless. I’d love to hear… it just might help me with this continuing battle that circles my brain constantly…! Focus On Life - Can you feel the Love? It is now week six of Focus on Life. Sally from the Studio Sublime sent us the challenge this week to see if we could 'feel the love'. 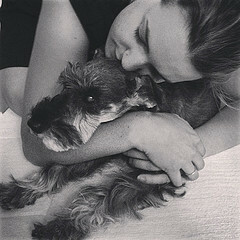 I snapped this one last night... we are all besotted by our little Miniature Schnauzer dog, Pepper. This is her with my daughter. At 12, ( is that 84 years in human terms? ) years of age, Pepper is such a little fighter. She has Lupus, Diabetes and now has started to lose both her vision and hearing. I can hear some of you say..."surely it would be kinder to let her go?" Well, even though she has all those formidable health issues, she seems to enjoy her day. She is still reasonably active, enjoys her food and is in no obvious pain. Most days, ( unless it is too hot or rainy... sensible girl! ) she still loves her twice daily walk. She loves being where we are and follows us from room to room just to be part of the action. Today she sat with me in the studio, quite comfortably while I fiddled around (no gas or loud hammering noises) with a piece I was working on. It was nice to have 'someone' to talk to! So, she is with us for a bit longer. We all know her time is probably short, so we hug her constantly! I think it is the love of "her people" that keeps her going. Laura and Pepper - February 2013. Do you remember my dressmakers form? I called her Collette. She sits in my bedroom and I think she looks pretty good here.... everything is pretty neat here ( well I think so) as we are selling our home after 25 years! Scary thought really! 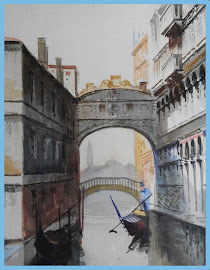 There's also our Bridge of Sighs painting and the old Japanese calligraphy box.... I love to have things with a bit of character around.... the bedside cupboards belonged to my parents-in-law and the cedar chest was my parents. Next time around I am hoping to buy a more modern home.... I don't mind a mix of new and old although this room is definitely weighted towards the old. I hope I can still fit these old favourites in our new home... we shall see! 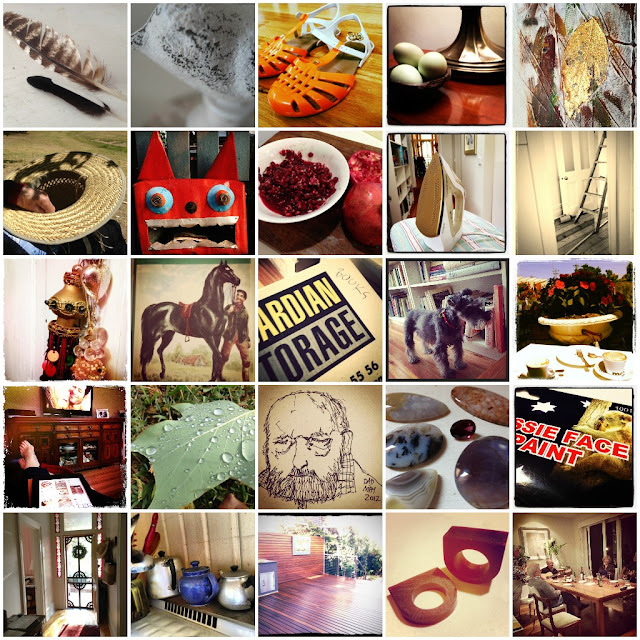 This year I am attempting to take a photo a day, that has been pertinent to my day. These days when most of us have camera phones, it is a pretty easy task to take a snap or two. 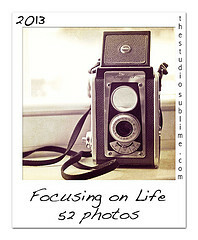 I have joined up to the Flickr group 2013PAD (photo a day) and so far, have managed to keep on track. I attempted to do this last year but only managed to get to the end of July... this year will be different!! The power of positive thought....! Here are two collages that I put together on Pic Monkey, a very easy and free photo processing site. I use it as I love the collage feature... I just wish it had a collage option for a whole month at a time! You can see my photos each day by clicking on the Flickr banner on my blog side bar or from here. The rest of January 2013PAD photos! If you haven't thought of this, I urge you to give it a go. It is fun. It makes you more observant. It encourages you to think and appreciate your day and what has occurred in it. A bonus is at the end, you have a wonderful record of the year gone by. It is not too late.. there are still 11 months to go! I Heart Macro - a beady cup! Nine years ago, I made the exciting journey to the Bead and Button show in Milwaukee, Wisconsin. The trip entailed flights from Melbourne, Australia to Sydney to Los Angeles to Chicago to Milwaukee. I cannot remember exactly how long it took, but I do remember it was LONG! The last leg, on a smaller plane, was made delightful by the meeting of a lady on the plane who was from Milwaukee. She drove me, with her family, out of their way, from the airport to my hotel doorstep. I cannot remember her name, but I will always remember her kindness. The beads I purchased at this wonderful show have long gone but I still use this cup daily. It is covered with the pictures of talented and celebrated American lampworkers and was released by the Bead and Button magazine to celebrate their 10th anniversary that year. Occasionally, I think it is time to do that trip again... next year will be 10 years.... hmmmm....Might need to start saving now! 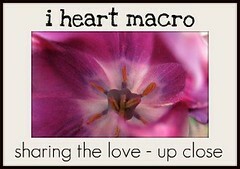 Today, I am linking up to I Heart Macro at Studio Waterstone for those who like to take up close and macro photos. Please do join me over there. Latest Pins - hover to see larger image. 2013 A PHOTO A DAY. This is a Flickr badge showing items in a set called Lampwork Beads. Make your own badge here.